Get them young! 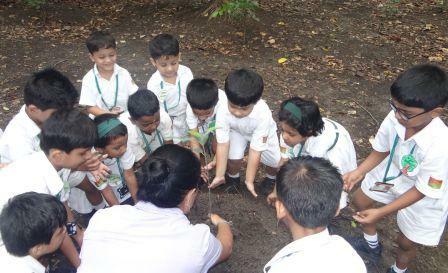 Some 125 kindergarten kids toddled around Taru Mitra bio reserve to breathe in the sights and sounds of the forest, and of course to plant their very first tree! Tarumitra, ‘friends of trees’ started the gala celebrations of Van Mahotsav on July 27 in its Digha based bio-reserve with students, interns, volunteers and Tarumitra members participating. The celebrations were inaugurated by Mr. Tripurari Sharan, IAS, Principal Secretary, Environment and Forest department, Bihar Govt. who graced this solemn occasion. Nearly 125 students from the nursery wing of Delhi Public School along with the teachers and non teaching staff came with great zeal to celebrate Van Mahotsav . The programme started with prayer song and nature poetry beautifully performed by the tiny tots of Delhi Public School. The teachers also sang a song titled “Vasundhara” which set the perfect tone for Van Mahotsav celebrations. Principal Secretary while addressing the audience became nostalgic and addressed the tiny tots as his grand children. He then performed an aarti with the chanting of mantras under our Mother Tree, Kamroop. 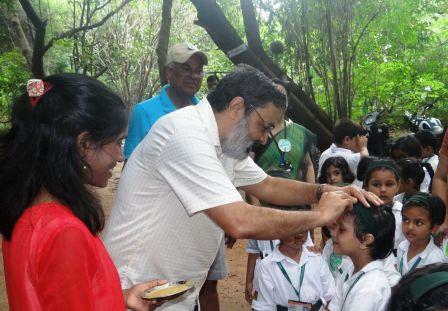 He applied tilak made of mud (mitti) to the tiny tots who then proceeded to the Panchvati forest area for plantation. Along with the kids of Delhi Public School, Principal secretary, Mr. Tripurari Sharan planted a rare sapling by the name of Bangalore Violet. Delhi Public School gifted asparagus sapling with a beautifully painted earthen pot . This sapling has been named ‘Delhi Public School’ as an adopted family member of Tarumitra. Students brought placards having green slogans of each one plant one, trees are our best friends, no trees no life. Rev Fr Robert Athickal SJ, Margaret Molomoo, Shashi Darshan, D N Prasad, interns and volunteers were present during this occasion.